SIGRAD 13, June 13-14 2013, Norrköping, Sweden. This paper presents a new method for representing Light Propagation Volumes using an octree data structure, and for allowing light from regular point light sources to be injected into them. The resulting technique uses full octrees with the help of a separate data structure for representing the octree structure. The octree structure enables light propagation to be performed at a lower resolution than the base resolution, resulting in fast propagation and overall faster rendering times. 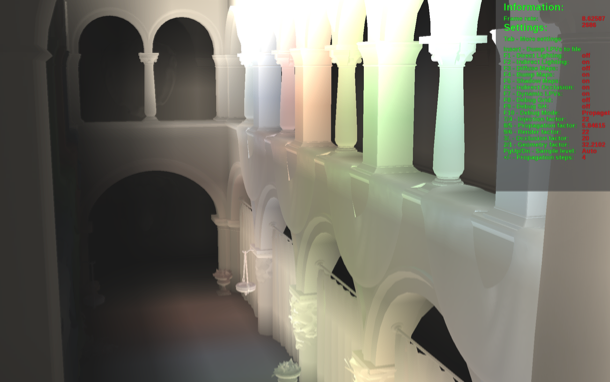 The implementation of the technique is capable of rendering the Sponza scene at 9 frames per second, which is 8% faster than the original LPV technique. Author's web page, with source code.